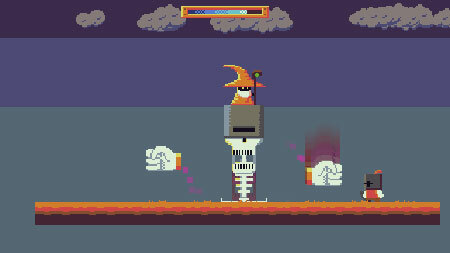 Peasant Knight is a challenging puzzle-platformer developed by Ratalaika Games SL. You can play with only two keys: jump and stop. All the while you’re relentlessly dashing forward into traps, enemies, and hazards. The game has a tongue-in-cheek tone that fits well the many ways to reach your demise. The game features more than 100 levels to solve. You have 18 traps, enemies, and bosses to overcome. If you get stuck in the game, check out the video walkthrough and gameplay for the game. This entry was posted in Nintendo Games, PS4 Games, Walkthrough and tagged Peasant Knight Cheats, Peasant Knight Gameplay, Peasant Knight Guide, Peasant Knight Strategy, Peasant Knight Walkthrough by Marvin. Bookmark the permalink.